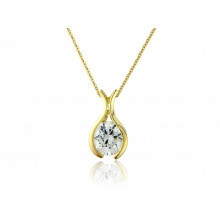 The tension set Cubic Zirconia gives the illusion that the stone is floating within a wishbone gold design. A clever, innovative item of jewellery. All elegantly crafted from Rose Gold and Pendant provided with a fine, trace chain with addition feature to shorten length from 18 inches to 16 inches.